For domestic voters the deadline for election officials to send Vote-by-Mail Ballots is between 35 and 28 days (7-day window) before an election. Deadline to submit a Vote-by-Mail Ballot is 7 P.M. on Election Day. 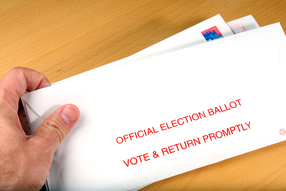 Mail Ballots may be returned in person, by mail, or by authorizing a designated person to deliver the ballot to the Supervisor of Elections. 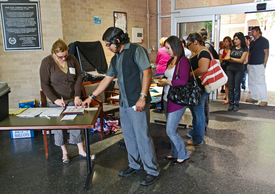 A Vote-by-Mail Ballot cannot be accepted at an "Election Day" polling location. Each county maintains its own information for requesting ballots and voting by mail. Bring a photo ID with a signature, such as a Florida driver's license. A voter who does not show required identification or whose eligibility cannot be determined at a precinct is entitled to obtain a Provisional Ballot that will be validated as a vote at a later time. For addition information on early voting visit Florida Division of Elections website. The General Election is held in November of every even-numbered year. The Primary Election for nominating party nominees for the General Election is held 10 weeks before the General Election. Additionally, a Presidential Preference Primary Election is held in Presidential Election years. Special elections may be called at any time during the year. Polls are open from 7am to 7pm. Anyone in line as of 7pm will be allowed to vote. Bring a photo ID with a signature, such as a Florida driver's license. ​A voter who does not show required identification or whose eligibility cannot be determined at a precinct is entitled to obtain a Provisional Ballot that will be validated as a vote at a later time. HAVING TROUBLE VOTING ON ELECTION DAY?